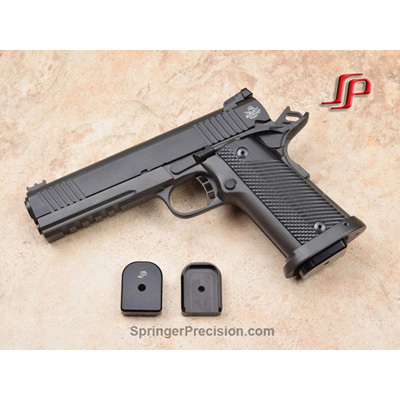 Rock Island 1911 A2 or Para Ordnance P16 10 round .40 S&W magazine with a blued finish MGP164010B. If your pistol has a magwell/funnel the metal base plate on these magazines may prevent insertion. These are double stack magazines. They won't fit single stack 1911's. The magazines aren't compatible in the PARA USA 16.40 .40 S&W PRO CUSTOM, they take a longer magazine. Customers have told me that the magazine doesn't work in the 10mm RIA 1911 A2 without modifying the magazine feed lips, THEY ONLY WORK WITH THE .40 S&W..